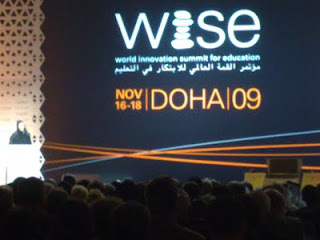 Day 1 at the World Innovation Summit for Education saw people literally from all over the world converge in Doha. A real meeting of the minds, a real melting pot of ideas, experience and a common motivation to discuss what is happening in education now with a view to improving it. 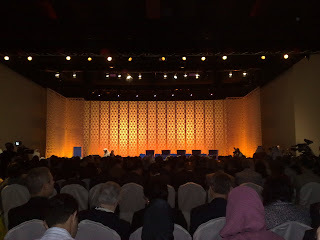 The overriding theme is "Global education: Working together for sustainable development'. Complete accolades to the multimedia people, extremely powerful and successful audio/visual, streamlined, professional....excellent! 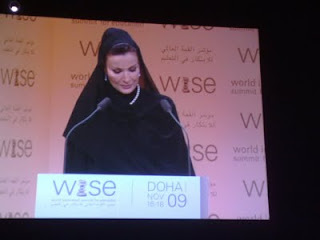 Her Highness Sheikha Mozah Bint Nasser Al Missnad welcomed everyone in the opening. You can view her speech highlights on YouTube. She spoke in Arabic, which was no problem as a sophisticated headphone set wirelessly connected to translators is provided in all rooms. She spoke about opportunities and sustainable development, about innovation being a sustainable culture and how innovation should be its very nature stem from education and be a part of education and is in fact a condition for international peace. 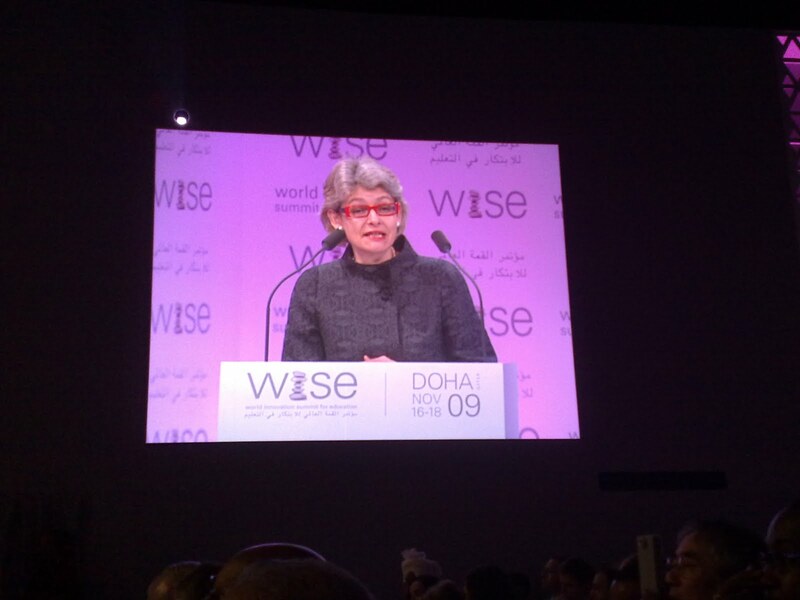 The newly appointed Director-General of UNESCO, Irina Bokova spoke next (her first day on the job! and also on UNESCO's 64th birthday). She spoke about education needing profound innovations, with ongoing dialogue. 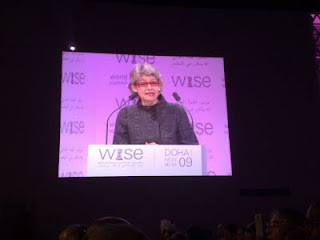 She urged an interdisciplinary approach and stated teachers were a top priority for UNESCO and adequate training was needed to meet the 21st century demands. 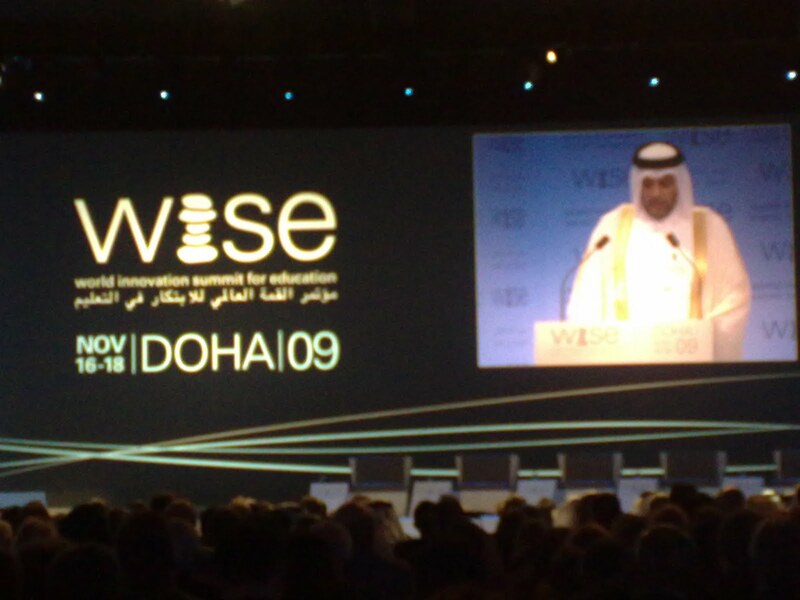 Dr Abdulla bin Al-Thani, Chairman of WISE and Vice-President of Education, Qatar Foundation also spoke about his expectation that the event will foster debate that will give rise to action. He also quoted (and I forget the source! ), "Knowledge is of the past, Wisdom is of the future', with the message to make the most of our sessions together to share knowledge in order to become 'WISE'. There is talk about Qatar Foundation wanting outcomes that are tangible and realistic, although specifics have not been detailed. Of the four sessions we all attended 2 were plenary and 2 were breakouts. The discussion at the breakouts was mature, sometimes intense, sometimes self-motivated or self-serving, but always with the objective of reaching out and connecting in order to make better more secure networks and liaisons for future development. There is a missed opportunity here to create a vibrant learning community using current and proven technology. Internet access has not been provided for regular attendees (media have a password to access the WLAN). I have asked for access as an 'international blogger' but was told I had to pay for it, so Day 2 this is what I will probably do. However, it strikes me as odd that here we are talking about innovation in education and yet we are not modeling it in terms of gathering participants into an online educational network, encouraging online interaction and discussion and building forums and groups that can act as launching pads for the next 12 months of discussion and action leading to another WISE event. At the end of the breakout sessions people were asking, well what happens now? How do we connect with others in the room to sustain the conversation and start to act on what we proposed or suggested? Will the session chair person contact us? How will he know how to find us? I really missed having a backchannel, being able to use Twitter and just being online during the sessions. Sitting with Tom Barrett, who has a media PW and was online, I felt like a poor cousin, and (shock, horror) so easily slipped into taking notes with pen and paper! I have not done this for years.....but felt a little odd with a laptop when 99.9% of participants did not have one! 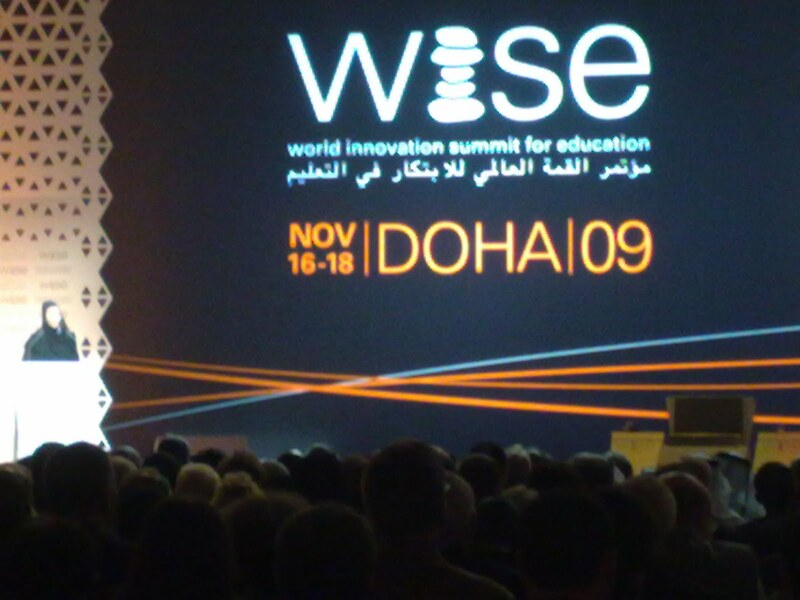 Don't get me wrong here, I am enthralled and honoured to be in Qatar at this event, to be representing my school in Beijing, Beijing (BISS) International School, and to be representing Flat Classroom, however wouldn't it have been interesting if as we all arrived at WISE we were given a NetBook (I do not think this is outrageous...bulk buy at a cheaper price, they have already spent millions on this event anyway), full access to the Internet via WLAN and full instructions on how to join and be active in an online educational network! Imagine the possibilities. QF could design their own, or use a Ning, or ELGG, or whatever.....but to provide this from the outset....or better still get us signed up as a condition of registration to the event! OK, out of time, have to get in the bus and embrace Day 2 WISE. So much more to say from Day 1...will have to wait. Follow the action on Twitter, and through the hash tag #wise09, and the WISE official YouTube channel. The lack of some formal medium for interaction between participants also frustrated me. Not in a "stomp my foot, I wish I were not here" way, but rather in a "what a huge opportunity missed" way. My suggestion to RAND and QF and anyone who would listen was a low tech one (though I like yours better in many ways). I suggested they replace one or more speaker session each day with discussion sessions...they could be spread out over all the hotels, and so limited to groups of 80 (ten tables of 8 people each). Each session would be a large room with a pannel of "experts" but after a brief introduction and a framing of a key question by the experts, the tables of 8 would be asked to spend an hour discussing solutions/reactions to the question. For the last hour, each group of 8 would get 3 minutes for their designated presenter to deliver 2-3 key points (not already mentioned), followed by up to 5 minutes of reaction from the pannel. I think the result of such discussions would be creative solutions and a much greater diversity of opinions, not to mention the obvious opportunity to connect with people beyond networking in the lobby. Each table could submit their three key points electronically for editing and publication on the website. With just one such session, the many bright minds in attendance would have felt they had their say. If only with 7 other people who signed up to discuss a topic of mutual interest. 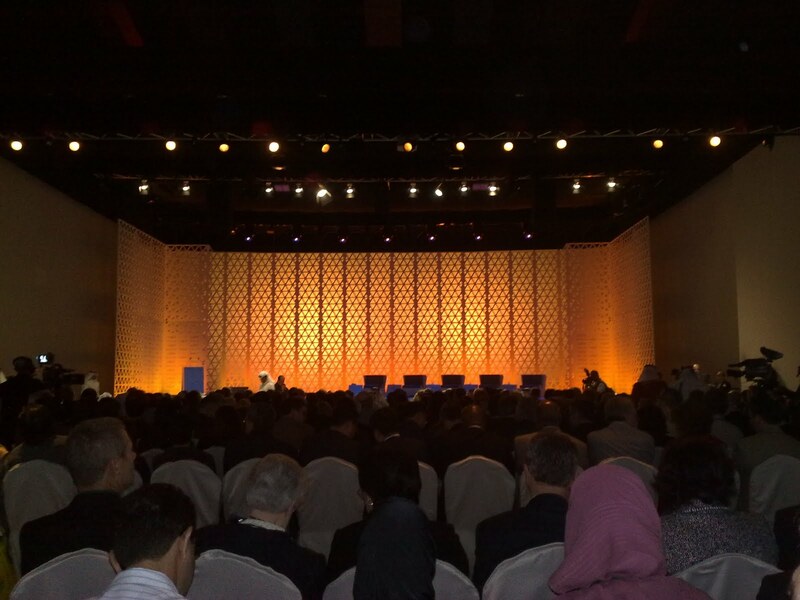 In talking to others in attendance, it was clear that many felt they traveled across the globe only to have no opportunity to express their opinions or contribute to the noble cause that QF has taken on. I felt I gained enormously from being there, mostly from the contacts I made in the lobby. Of course, some of those connections may lead to projects that have an impact. But in terms of my immediate impact on the summit itself, I had no opportunity to contribute other than asking a question or two in the very crowded breakout or plennary sessions. I have lots of opinions that might have furthered the discussion and I'm looking foward to seeing if there a blog will be started by QF to collect real feedback. Andrei, thank you so much for your thoughtful comment to my blog. Yes, low tech for some, maybe a high tech option for others, but with a focus on allowing more voices to be heard. I really like your idea of submitting ideas in a considered, ordered way electronically for each session. That way the organisers would have a true record of the session. I made many contacts in the breaks as well, and by sitting next to different people. Through the exchange of the standard business card I now have people to follow up on, which I have already done via email....with limited response so far. I also found during the 3 days that the same people got up and asked questions in sessions. There were a couple of people who really wanted to push their own barrow, but I suppose the format of the sessions left itself open to this. Just checked the WISE website again and can see no place for discussion or input yet. Will there be a post-event survey I wonder? I did receive a thank you letter however. Tom Barrett has a discussion on his blog that I am about to contribute to as well. 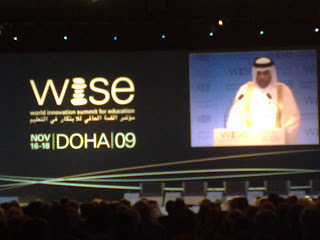 http://edte.ch/blog/2009/11/19/wise-qatar-doha-diaries-3-a-call-to-action/ I am sure he would love to hear your input. 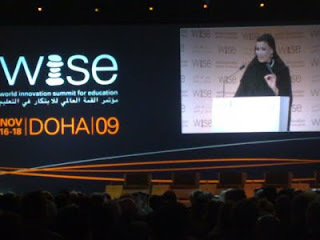 I have been trolling the various blogs and other related media posts about WISE since the event. They seem to have a common theme about what happens next. Some commentary on the LinkedIn Wise group site, but you, and several other bloggers are putting up concise, salient posts(thanks!). It seems that some writers viewed the event as an extension of inclusion/access to higher education, while others were invited and spoke about early childhood, gender, and disability. I had hoped there would be more about older adults (>25 y.o) as part of the lifelong learning continuum. Perhaps we will see this emerge in the upcoming discussion forums. Thanks for the good intel and reflections, I hope to meet you at an upcoming event.